I am one of those people who enjoys public transit. Yeah, it takes me 45-60 minutes to get home (merely 6 miles) but in that time I’ve made phone calls, caught up on my news, updated my Facebook — all while not breaking the texting laws nor blowing a stop sign. But that doesn’t mean I don’t like entertainment in the Decaux bus stops. 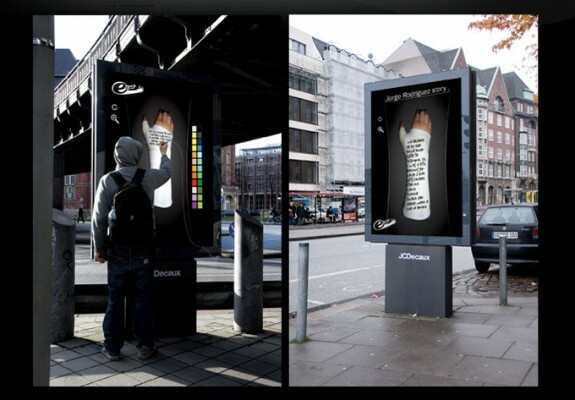 So a while back, Artistic Things posted this very ingenious idea at a bus stop in Hamburg, Germany (unconfirmed). And apparently it wasn’t even the Sharpie folks (as you see from the surprise on their own blog). Super-clever use of the technology. I can see using something similar at a tradeshow booth even (if you don’t want to spend the money on public adverts). Very cool stuff, folks. Image: Artistic Things, et. al.